NASA astronaut Scott Kelly is seen during his first spacewalk outside the International Space Station on Oct. 28, 2015. Kelly and crewmate Tim Kopra will make a 3-hour spacewalk today (Dec. 21) to fix a stuck railcar on the station. Two American astronauts will take a short, but unplanned, spacewalk today (Dec. 21) to fix a stuck railcar on the International Space Station in time for the arrival of a new cargo ship later this week. NASA astronauts Scott Kelly and Tim Kopra expect to spend more than three hours to latch down the outpost's Mobile Transporter, a railcar that moves the station's robotic arm along the length of its backbone-like main truss. 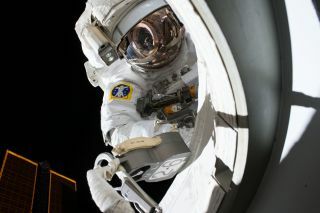 You can watch the spacewalk repair live here beginning at 7:30 a.m. EST (1230 GMT), courtesy of NASA TV. The Mobile Transporter must be latched securely in place ahead of the planned arrival of Russia's unmanned Progress 62 cargo ship on Wednesday (Dec. 23), NASA officials have said. The railcar jammed up last week, stopping just 4 inches (10 centimeters) away from its intended storage point near the center of the station's main truss. NASA engineers suspect a stuck brake handle is what stalled the Mobile Transporter, but need Kelly and Kopra to manually free the railcar and secure it in place. Today's space station repair will mark the third career spacewalk for Kelly and the second for Kopra, who only just arrived at the International Space Station last week aboard a Russian Soyuz spacecraft. Kelly and Kopra form one-third of the station's six-man crew. British astronaut Tim Peake and Russian cosmonauts Mikhail Kornienko, Sergey Volkov and Yuri Malenchenko round out the crew. Kelly and Kornienko are flying a one-year mission to the space station and due to return to Earth in March with Volkov, who is on a six-month trip. Kopra, Peake and Malenchenko launched to the space station on Dec. 15 to begin their own half-year in orbit.